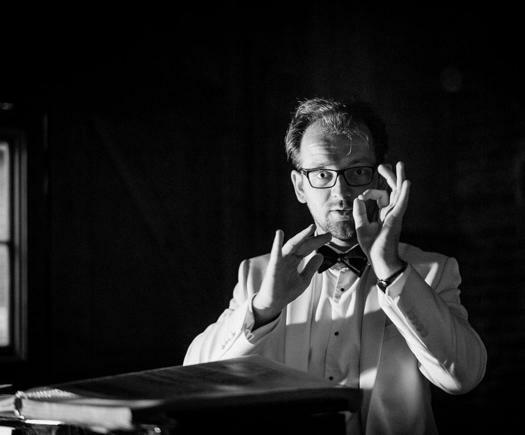 Sinfonia Viva and Principal Conductor Frank Zielhorst returned to Derby Cathedral in 'Searching for Mozart', the first of what looks to be a developing series of concerts - Derby Cathedral, Derby, UK, 6 February 2019. The three Mozart works on the programme - Horn Concertos Nos 2 and 4, and Symphony No 29 - all have galloping hunting-horn style finales, echoed in the two other pieces, which neatly tied the evening together. Thanks to higher-than-normal staging, and placing the second violins on the right, there was an immediacy and openness to the orchestral sound that made its impact instantly. Malcolm Arnold's Sinfonietta No 1 opened. The initial theme represents the composer at his most suave, and it had all the ingratiating flow you could want but, as so often, amid the Arnold jolliness there was something darker going on. The second movement's episode for three violas, followed by muted horns over pizzicato strings, was allowed to cast its disquieting shadow over the rest of the movement. Even the finale is not just the jolly romp it seems at first, and though the performance was plentifully rumbustious, those niggling dark corners refused to be completely dislodged. 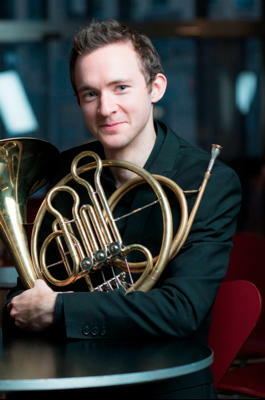 Alec Frank-Gemmill then joined the orchestra for the first of the Mozart concertos. Everything in this thoroughly engaging performance was sprightly, polished and gleaming. Mellifluous playing in the lyrical first two movements paved the way for a bouncy finale, with engaging exchanges between soloist and orchestra, Frank-Gemmill making his grace notes sound really mischievous, and with a payoff that echoed that of the Arnold. It's not much of a stretch to imagine the two composers getting along together famously. Lennox Berkeley's Gallic-flavoured fastidiousness makes him a different kind of composer, but he earned his place in the programme for his great love of Mozart. The Serenade for Strings, probably his most popular work, got an elegant reading, alive in every detail from top to bottom, from the bracing neo-classicism of the opening movement, to the wistfulness of the second. The galloping scherzo comes third in this case. Here players and conductor made a feature of the quick-fire exchanges between upper and lower strings, while the curious episode playing col legno violins off against pizzicato everyone else became a deliciously spooky moment. The finale's hauntingly elegiac leave-taking was suitably poignant. In the second half, Mozart's Horn Concerto 4 got off to a stylish, celebratory start. Frank-Gemmill's singing tone seized every chance to shine, but he also showed an engaging willingness, for time to time, to let his instrument sound - well, brassy, throwing in impromptu-sounding trills and stopped notes, and occasionally enhancing the effect by turning to point the bell of his instrument towards the audience. We know about Mozart's fruity sense of humour; this came close to a musical equivalent, and I bet the composer would have loved it. There's nothing particularly fruity about his Symphony 29, just the absorbing sight of a young genius in the first flush of symphonic maturity. The playing was full of Mozartian graces, elegantly buoyant in the first movement, and with silky muted violin sound in the second. The minuet had an appealingly crisp rhythmic snap, while the galloping (again) finale was both skittish and flamboyant. The next composer in Viva's searchlight will be Tchaikovsky, in a couple of month's time.